Hell wants him; Heaven won’t take him…your stuck with him. So ok, a movie based on a really cool character that fights demons and has some awesome abilities and even more awesome adventures and it’s based on a comic. Ok, so far so good. 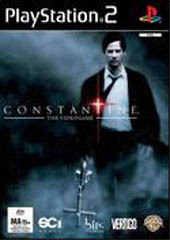 Constantine based on the DC/Vertigo comics’ Hellblazer makes for a good popcorn movie… but like so many other awesome ideas that seem to come across so well in one medium, Constantine the game leaves you wanting to get an exorcist of your own to wipe away the evil that is Constantine the game. So ok, maybe it’s not that bad, but like so many other films to games this one falls short of the mark and leaves you wondering what the heck had they been thinking? The games visuals do a good re enactment to the film and in the opening cut scene we get to see that Constantine is some kind of exorcist kind of guy. The cut scene in fact gets you pretty amped up in hopes of some awesome demon fighting action but then you soon find that fighting these loping baddies is not all its cracked up to be. To advance in this adventure Constantine has to transport himself back and forth from Earth to Hell, what one gathers is that hell is sort of a dimension that exists right along side our very own world. In fact in one part of the game when you have to get over a damaged wall or door in hell…. You go back to Earth and move a table or crate or chair and when you go back to hell, the area you are in is mirrored, but here it is distorted and scarred from fire…but more importantly there is now a crate (Or what ever item you moved) in place like a distorted mirror image from earth, and you may now make it over the obstacle. More than a few times there is some back tracking after finding a locked door, our hero must find the key to the door somewhere further on and then come back after finding the prized key. Ok, now I know it’s a game and the game programmers and writers have to think of some kind of engaging thing to keep you occupied so you think your having fun and adventure…but just once I would like to see a hero like Constantine kick open the darn locked door, or blow it open with a few blasts of gun fire… or at the least among all the spells he was able to cast there was not one door open spell. Ok let me get off the rant, you get the idea. Since we are on the subject of spell casting, Constantine does have some spell casting abilities to put hurt on some demon targets. The idea is to hit a certain button sequence before the time runs out in order to successfully cast the spell. While this is a pretty neat idea, you never really feel that there is cause for alarm because the time allotted always seems more than enough. Not only does Constantine have spell casting abilities, but he also has a “SECOND SIGHT” ooohhh, ahhhhh. This comes in handy in dark places, sort of like an occult night vision goggles but not. Further the “Second Sight” comes in handy for some pesky demons that seem to be in some kind of stealth mode, you just can’t see them with out the use of the “Second Sight” ability. I use the term ability loosely here since the effect is kind of a bluish tinged haze, maybe the cancer eating away at our heroes lungs causes some of the meds he is on to kick him into some kind of acid trip or something. Who knows? The point being, this blue haze effect blows, if fighting in this game was even close to an enjoyable experience in the first place then the blue haze effect of “Second Sight” would be tolerable at least. Visuals in the game are passable; taking some pretty darn good visuals that do bring you into a supernatural world, the sound on the other hand does not compliment things at all with sounds such as gunfire that seem to drop out into silence for no reason. Sounds come off a little on the dull side if you can believe that, nothing invoked a “Holly crap my character is gonna die.” From me at all and there are other games out there who utilize sounds and voice over to far better effect. In the end Constantine is a repetitive game that fails to really endure itself to a player and will leave you wanting an exorcist of your own to get rid of this title from your collection fast fast fast. So ok, if you’re really really bored or can’t sleep this may do the trick, better than a sleeping pill. This is a shame since there are other Atari and or SCI titles out there that I really enjoy, but this is not one of them.